These are the Black Friday Marketing tactics you need to know in order to have a successful Q4! Black Friday & Cyber Monday is a time of extreme joy or huge disappointment for a business. Keep reading to make sure you’re the first one! The cost of advertising skyrockets (CPM’s and CPC will increase 2-3x on advertising platforms a few days before and during BFCM) but conversion rates on site will also double as shoppers go crazy trying to get the years best deals! Do you have a Black Friday marketing plan to take advantage of this or… are you going to leave it to the last minute to compete with the high advertising costs? If you haven’t started yet, you better make it a top priority & read the checklist below! To help you out, we’ve some tips for making your BFCM a viral success! Plus here’s a free landing page template that’s now available in all VYPER accounts (install it and dominate BFCM). ✅ Have a BFCM specific deal, below are some example deal ideas. A bundle pack of your most popular products. Use $ amounts over % it has a much higher perceived value. Have discounts above 20% at least, anything less and it might not be considered BFCM worthy. Auto apply the discount to the website/BFCM landing page instead of using codes (easier shopping experience). The idea is to try and increase your average order value as much as possible so that you can counteract the heavy discounts. Social validation (reviews, rating etc), show people that your product is amazing and this is the deal of a lifetime. Use a VYPER countdown contest leaderboard as your BFCM landing page. CPM’s and CPC double in the week of BFCM. Create large remarketing audience prior to this. People browse products 1-4 weeks in advance, then hold off on buying until BFCM. 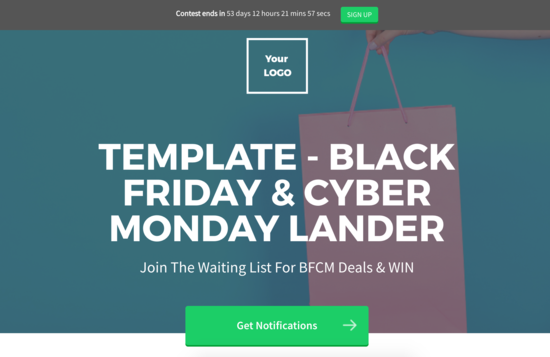 Run traffic to your BFCM landing page (or VYPER BFCM contest) 25-45 days before the sale and capture contact information to send notifications to e.g. “enter your email to get a reminder when deals go live”. During the BFCM week, run remarketing only. Prospecting will most likely be too expensive and by now you should have a large enough remarketing audience to drive a huge ROI. A week before (get ready for the BFCM deals). A day before (BFCM deal are being released tomorrow). Morning of (BFCM deals are LIVE). 3 hours left (BFCM deals ending in 3 hours). Another option is to get people to opt into other channels like Facebook Messenger to contact them there as well! Have a banner, hello bar or popup that directs people to BFCM landing page. Use the VYPER CTA widget to funnel all website traffic to BFCM landing page. ROAS will be down leading up to BFCM but once the sale drops you will make it back up as people hold off on spending when the sales are a few weeks out. CPM’s and CPC’s are doing to be 2-3x. Retargeting and emails are key. 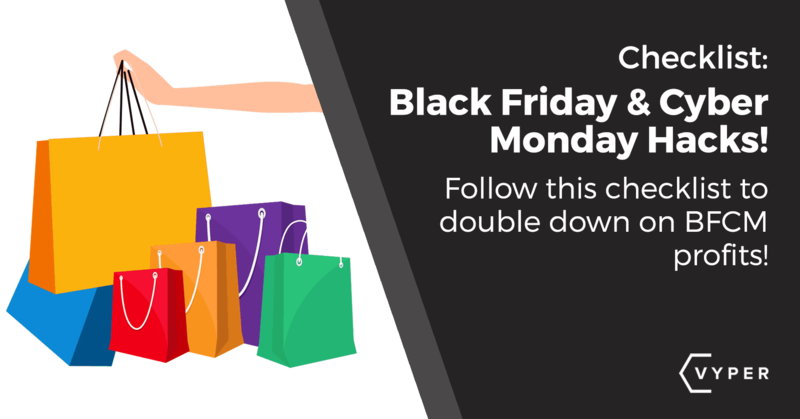 Take a look at this quick example video we put together on how to use the VYPER template to create a viral Black Friday Cyber Monday campaign. You can use these tips for any campaign, does not have to be a giveaway! 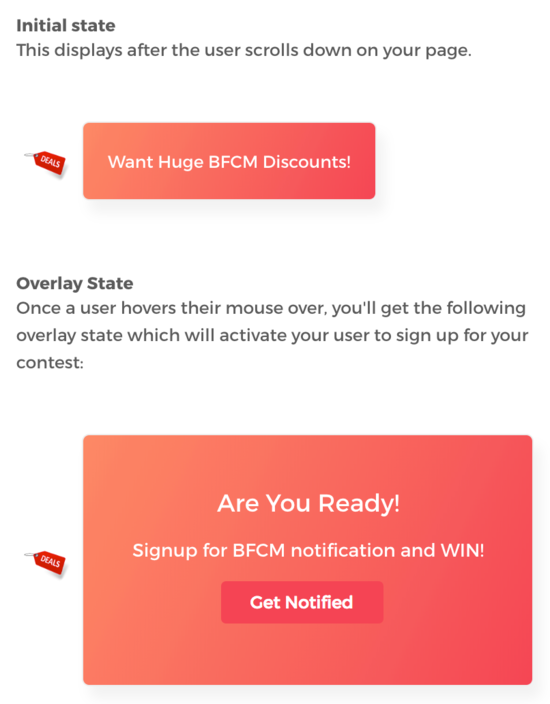 Create a free account at VYPER to unlock this BFCM template! 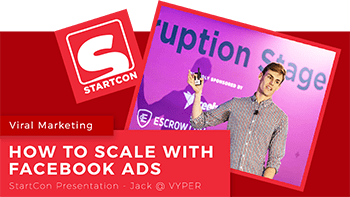 Follow the tips above, join our growth hacking Facebook group and ask any questions you need in there. Or you can add them below in the comments!